This will be where I keep things that don't quite have a place on my site, but deserve to be here anyway. Call it my "potpurri"! 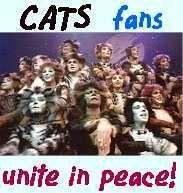 The final Broadway production of Cats will be June 25, 2000. This is Wizard and Joey. Wizard is a magical beast. He wasn't easy to catch. And sweet little Joey, well he just needed someone to love him. Would you like to adopt ponies of your own?